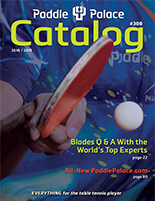 Please note: the Pure Color Advance paddles that are sold individually have Stiga 3-Star rubber. This set has Stiga 1-Star rubber. Very good for big cuts at the ball. Good control and security!